SYNOPSIS: Rich and dashing British Naval Captain Jack Absolute has fallen in love with American heiress Lydia Larkspur. But Lydia is in love with a romantic fantasy: she wants to elope with some penniless artist and live in “charming poverty.” Jack masquerades as a poor English composer named Waverley and wins her heart; Lydia’s aunt and guardian, the famously verbose Mrs. Malaprop, will not hear of it. She and Jack’s father, both unaware that “Waverley” is Jack, decide that Lydia should marry the real Jack. Jack—now his own rival—has a big problem: how to reveal his true identity to Lydia without losing her. He ties himself into knots to indulge her rebellious fantasies, but when she learns the truth she rejects him. Jack’s friend Nicholas Astor loves Lydia’s cousin Julia, but his gloomy fear of being loved only for his vast fortune drives him to put her love to such ridiculous tests that she finally breaks off their engagement. Baron von Hakenbock, a bellicose Prussian fortune hunter, has been carrying on a secret correspondence with “Celia,” whom he believes to be Lydia but who is really Mrs. Malaprop. He and one of Lydia’s rejected suitors, Jasper Vanderbilt, prepare to fight simultaneous duels: Jasper with his rival, the non-existent Waverley, and the Baron with Jack. Jasper is the bumpkin son of the Kentucky Vanderbilts; he also does not know that “Waverley” is his friend Jack. It all comes to a head on the dueling field. True love averts the duels, clears up the misunderstandings, and unites the proper pairs. Buoyant melodies, supple harmonies and perky rhythms. In spirit, “The Rivals” harks back to Rossini and Donizetti; in sound, it weds Puccini’s generous lyricism to the dancing meters of Bernstein’s “Candide.” . . . the libretto is bright and witty. . . the music unfailingly suits the words with elegant ensembles and sly allusions. Unrivaled . . . for a rollicking good time, this operatic adaption has few rivals among its contemporaries. . . . The composer has done a marvelous job in both the music and libretto. . . charming and comic ensembles and arias of every sort. . . . It was a treat. Irresistible . . . Mechem’s fresh, classical work will be a significant factor in the art’s future, and will enrich the opera fan while tempting those who might like to try opera for the first time. . . had the audience standing on their feet. Absolute perfection. . . buoyant and hilarious as a classic screwball comedy [with] glorious music. . . One of the finest pieces of music theater I’ve seen in some time—on any stage. 3 “I’ll elope!” Lydia’s aria. 5 “Here are my rules.” Mrs. Malaprop’s aria. 7 “Do you know?” Jack’s aria. 9 “A beautiful wife.” Baron von Hakenbock’s aria. Skylight Opera Theater, Bill Theisen, Artistic Director. Stage Director: Dorothy Danner; Music Director: Richard Carsey; Lydia: Alicia Berneche; Mrs. Malaprop: Diane Lane; Jack: Christopher Burchett; Nicholas: Zach Borichevsk; Julia: Katherine M. Pracht; Sir Anthony: Robert Orth; Lucy: Christine Robertson; Jasper: Matthew DiBattista; Baron von Hackenbock: Andrew Wilkowske. 1 Opening scene, Lydia and Mrs. Malaprop. 2 “Lydia’s Romance.” Duet, Lydia and Julia. 4 “He’s so handsome.” Julia’s aria. 6 “I taught my son.” Anthony Absolute’s aria. 8. Ragtime Trio. Jack, Nicholas, and Jasper. But after I decided that my second opera would be a serious, historical drama about the American abolitionist, John Brown, I was asked by some of the same people why I hadn’t followed up the great success of Tartuffe with another comic opera. I guess comedy had suddenly become easier. As it turned out, conventional wisdom was wrong a second time. John Brown took three times as long to compose as the comic Tartuffe, and ten times longer to be produced. I have never regretted that time and effort, however, because I consider John Brown my best work; its premiere was just as successful as Tartuffe’s. Nevertheless, I needed some comic relief, and began to look for another classic comedy. I wanted this opera to be quite different from Tartuffe — American, if possible — one that would give me a chance to write in the light-hearted idioms of American musicals. I had grown up with the great tunes of Gershwin, Kern, Porter and Rodgers. I tried to imitate them in my own early songs. I liked musical comedies and wrote a couple of bad ones, first in the army, then as a Stanford undergraduate. But as I got to know opera better, I found the comic operas of Mozart and Rossini much more satisfying. Not only were the arias and ensembles more beautiful and musically sophisticated, but I particularly loved the way action and theatrical humor were turned into delightful music. I tried to follow that tradition in Tartuffe, but its musical style was international rather than specifically American. I failed to discover any suitable classic American comedies, and the popular Broadway works of the 20th century seemed dated or otherwise not right for opera. I widened my search to British plays that could possibly be Americanized and hit upon Richard Sheridan’s The Rivals. It has a brilliant comic story and a rich variety of characters. It takes place in 18th-century Bath, England, where royal titles were wedded to high society money, and it occurred to me that Newport, Rhode Island about 1900 was not only a good American equivalent, but just the sort of flamboyant place and period that would suit opera to a T.
I visited Newport and read about its history, much of which is still evident in the 80-room “cottages” where the Vanderbilts, Astors and their friends sailed, dined and attended balls and horse races. The casino is still there, and from the Newport Historical Society I obtained photographs from the Gilded Age that showed its café open to the lawn tennis court on which the United States championships were first played. (As a former tournament player, I couldn’t resist beginning one of the opera’s scenes with the sound of a bouncing tennis ball.) The casino is a public meeting place; it serves as one of the two main sets in the opera, alternating with the elegant salon of Mrs. Malaprop. This was the era of the “dollar princesses” but also of their exact opposite, the “Gibson Girl,” made popular in the satirical drawings of Charles Dana Gibson. She was a more independent, modern young woman, seeking personal fulfillment and scorning the role of a traditional debutant looking for a husband from her own wealthy class. In Sheridan’s play, the ingénue is named Lydia Languish, but as I wanted to emphasize her American modernity, I named my Gibson Girl Lydia Larkspur, a feisty young woman with no hint of weakness or dependence. The character who changes most is Sheridan’s belligerent Sir Lucius O’Trigger. The stereotype of a militant bully in 1900 America was not an Irishman, but a Prussian, so Sir Lucius becomes the fortune hunter, Baron von Hakenbock. I also gave him an idiosyncrasy borrowed from a character in Sheridan’s next work, The Duenna: he is terrified of marrying a beautiful woman. Indeed, writing this libretto and music was sheer fun, and I have been delighted that performers and audiences — even critics — have experienced it in the same spirit. 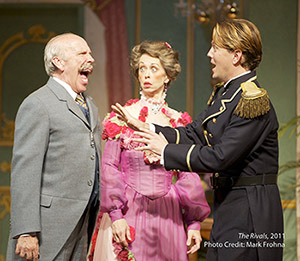 Unlike Molière’s Tartuffe, a funny but moralistic satire, Sheridan’s Rivals is an unapologetic farce. Nevertheless, its humor is based on human character and folly as observed by a genius. (How else can a young man of 22 who writes such a masterpiece be described?) There is plenty of social satire in both play and opera, but at their center is a harmless, ridiculous old lady, not a lecherous swindler posing as a holy man. By today’s standards Sheridan’s dramaturgy is old fashioned; I have changed its structure radically, but the ingenious plot is all Sheridan. I have often said that diverse characters are crucial to me in choosing a subject for opera. I have come to believe that the main reason — perhaps the only one — for turning a play or novel into an opera is the opportunity for music to make the characters and their actions come alive in a fuller, more palpable existence. The more diverse the characters, the more diverse and interesting the music can be. The right music can tell the listener wxho the character really is. To smell a rose, to taste a peach, tells us much more than words ever can. So it is with music; it can give us the indefinable essence of a character, which renders descriptive words superfluous. And once a character has been given a musical profile, the composer can vary the music as the character changes. Good operas often demonstrate this technique of variations on a theme, which creates a richer musical experience for the audience, especially if the opera is new. Two hours of unfamiliar music is a lot to digest. I have sometimes used musical idioms from American popular music in this work, but that does not make it a musical comedy. When I am asked what the difference between a musical and an opera is, I usually answer: musicals are for those who love theater and like music; operas are for those who love music and like theater. But that leaves out the fact that people who go to musicals love music, too — just a different kind of music. A better and shorter definition is this: operas cost money, musicals make money. So if you want to call this comic opera a musical, please go right ahead. And tell all your friends.